Hello everyone, and welcome to the Graveyard Shift, which is hosted by Kotaku's reader-run blog, TAY. This is a place to talk about life, video games, or anything else you want, so feel free to hop in and join in the topic discussion, or anything else you want. Then, when you're done, feel free to peruse the articles on TAY and TAYCLASSIC. Also check out the OFF-TAYpic taking place every weekday at 2:30pm (/end shameless plug) Is this your first time on TAY or the Graveyard Shift? Then check out this handy TAYtorial! So....This is for you! the Late Night / Early Bird / Office Drones/ Fabulous/Non-Fabulous/ Future Warriors! I am the terror that flaps in the night! Yet, I am also JollyBoots, filling in for Kluge on this most wonderful of frabjous days. So, what are the games you wish would come out, but you know are never to be? I'm not talking cancelled projects or games that didn't live up to their promise, but games with a premise so ridiculous that you and everybody else knows they'd flop, but you want it anyways. My pick? 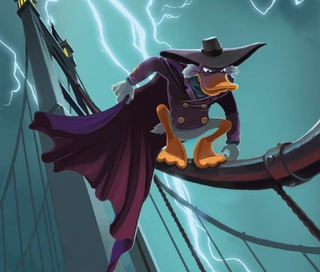 A Darkwing Duck game done in the style of the Arkhamverse Batman games. Disney's afternoon cartoons are all but dead and forgotten, so something like this will never exist outside of mods. But man, what I wouldn't do to get this game. I was going to offer up a few other choice topics, but the link uploader refuses to work. Damn you, Kinja! Feel free to ignore my ramblings, and discuss whatever you'd like!